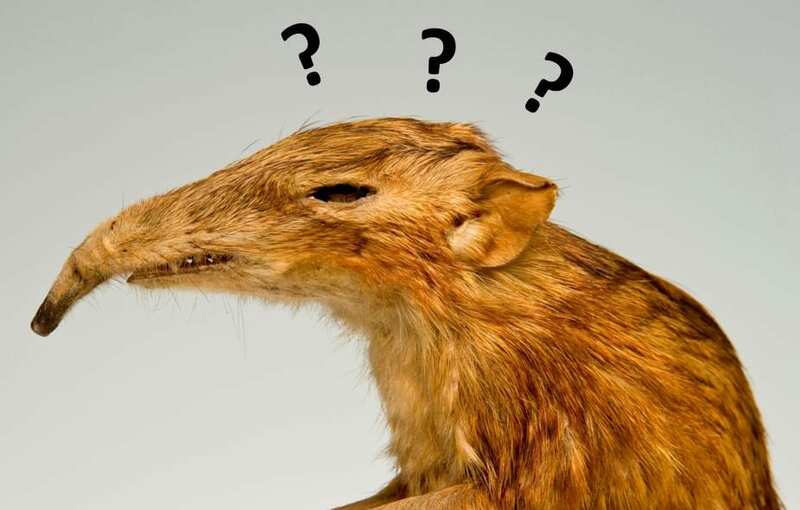 It’s enough to confuse an elephant shrew. True Cobras We all know cobras right? The cobra we could probably all name is the king cobra, Ophiophagus hannah, except depending on your view it isn’t a true cobra at all. True or typical cobras are ‘considered’ those snakes in the genus Naja which can raise their bodies off the ground and widen their distinctive hoods around their heads. However, there are a number of snakes called cobras, this wikipedia page sums it up nicely which aren’t in the same group creating a similar confusion to whether or not humans, chimps and gorillas are monkeys or not. Spare a thought for Hydrodynastes gigas, the false water cobra which being neither in the genus Naja or in the ‘cobra family’ Elapidae can be considered a false false false water cobra if you want to go there. True Eels True eels are ray-finned fish in the order Anguilliformes including the conger and moray eel families as well as many others. However, the well known electric eel and the lesser known spiny eels aren’t ‘true eels’, they are eel-like fish in other groups. Triply confusing is that eel-skin products such as wallets aren’t made from eels at all they are made from the skin of hagfish or slime eels (not true eels) which are a completely different kind of fish altogether. True Salamanders Here’s where scientific nomenclature and common sense really break down. Salamanders are animals in the order Caudata. However, ‘true salamanders’ are those salamanders in the single family salamandriidae that aren’t newts. By this rationale giant salamanders, mole salamanders, lungless salamanders and torrent salamanders aren’t true salamanders despite their name. Oh and congo eels aren’t true eels or even eels or true salamanders. They are a kind of salamander. Confused yet? Don’t blame me I didn’t create this mess. True Jellyfish This is a common one, I’m often asked “Are Portuguese man o’ war jellyfish or not”, my ‘expertise’ is drafted in to settle bets amongst friends. Despite being perhaps the most well known jellyfish they aren’t true jellyfish but may be jellyfish depending on your opinion. True jellyfish are animals in the class Scyphozoa but this group doesn’t contain the box jellyfish, class Cubozoa, or the stalked jellyfish, class Staurozoa. Scyphozoa, Cubozoa and Staurozoa are in the subphylum Medusozoa which also includes the class Hydrozoa which is where you’ll find the Portugese man o’ war. If you’re a stickler for consistency then you could argue that everything in Medusozoa, including the Portuguese man o’ war is a jellyfish. Alternatively, you could argue that there’s no such thing as a jellyfish you should just be more specific. The ultimate litmus test? See how the coastguard reacts when you’re lying on the beach screaming in agony because you were stung by a “gelatinous zooplankton in the class Hydrozoa”. True Crabs True crabs are crustaceans in the infraorder Brachyura. You know what’s next right? This doesn’t include hermit crabs, king crabs, porcelain crabs, mole crabs or indeed the human parasite commonly referred to as crabs. King crabs, hermit crabs, sand crabs and coconut crabs are in the infraorder Anomura. Doubly confusingly porcelain crabs and squat lobsters are closely related but the porcelain crabs aren’t true crabs and squat lobsters aren’t lobsters at all. If only they knew about their identity crisis. The pubic lice we call crabs are in fact insects, I’d say lice but there’s many ways of being a louse, true lice are a superorder of insects and an excellent Arnie film. These are just some examples and I don’t think you’d find a zoologist who would dare to use the true and false monikers for groups in the scientific literature. Occasionally, the confusion seems to be the only reason behind a non-news story running and running. Last year’s ridiculous false widow spider scare mongering seemed to only have come from the similarity in the name between this and the notorious widow spiders ignoring the obvious ‘false’ clue. There are also false scorpions, true bugs, true frogs, wasps that are called ants, true antelopes, false stag beetles and tens of butterflies which are the ‘false’ versions of superficially similar butterfly species. Isn’t language funny? Drop some of your favourite false and true animals in the comments. * Or not. A blog post for another time methinks. ** Only sometimes. There are over twenty genera of octopuses, only one of which is Octopus. I often lay awake at night wondering how the world would be different if the genus Wunderpus rather than Octopus was the colloquial name for these animals. Better. I think the world would be better. But then the Octonauts would be Wundernauts. Bad times. @Starfog Quite! Although animals with other animals names in their names is a blog post for another time.